Simply put , I'd like to be able to save all the Notes I'm making when creating macros out of of the patches on the editor stage relating to those notes. A very simple version of this request would be to have all the notes on the stage saved within the new macro regardless of the constituent parts of that macro being referred to or not. The second version would be one whereby the Notes could be tagged or stuck to a particular patch. If that patch is included in a macro creation request, then so is that note. This may or may not be something that Kineme can handle or even wish to touch upon. It might not even be possible, although seeing as how both are objects of a sort, perhaps they can. I shall seek to provide illustrations to my concept a little later. Second that. Copy and Paste of notes would be good too once the object has been made 'operable'. Maybe you/we should radar it as new feature? There are some internal users who want "selectable notes" as well -- as in, if you select an area, you get the patches as well as notes that are in that area. There are other variations as well. I'd really like this radar (even if it eventually gets marked as a dupe, this is one area that really needs to be more developed). Quartz Composer allows for the making of Notes which get saved onto the Editor stage. I would like to be able to associate Notes with one or more patches, like tagging or attaching by noodle and then have both patches to be turned into a new Macro being included in that Macro along with the Notes that have been associated, tagged or connected by a noodle or some such visual metaphor to those patches making up the Macro. Bug ID# 8197666 for copy, paste & marquee selecting of notes. A picture that shows roughly what the inside of the macro would look like. 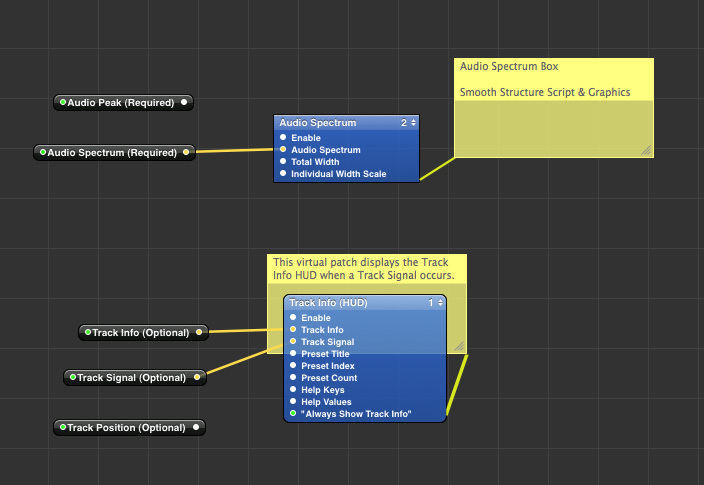 Prior to being turned into a Macro patch, these patches and pre-existing Macros [like the Audio Spectrum Macro , would already be showing the attaching thread / noodle, which one would draw out from the nearest corner to the patch or Macro related. It would be a user set option, not a default.